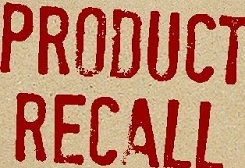 The U.S. Consumer Product Safety Commission (CPSC) has announced the recall of toddler’s chairs, another casualty in a low list of choking hazard recalls. For good measure, these chairs also come with a risk of your toddler cutting themselves. The recall affects 16,850 toddler’s chairs as there is a problem with the the staples on the back of the chairs. It has been discovered that the staples in the binding on the back of the chair may come loose, posing a laceration or choking hazard if swallowed. The Club style chairs come in three fabrics and colors, including: Suede in brown, pink, avocado green, red, and turquoise; velour in blue, green, pink, and red; and print fabric in chocolate dot on pink or blue. The Mod style chairs come in dark pink or zebra printed velour in chocolate on blue or pink. Or, they come on printed fabric of chocolate stripes on pink or blue. The Trend Lab name is on a label attached on the bottom of the chair with production date codes TL1007C through TL0812C.